Cyclists in the City: Southwark Council to close one of London's busiest cycle commuter routes from the City to Waterloo for a year. Use this route? Email your objections to Southwark today. Southwark Council to close one of London's busiest cycle commuter routes from the City to Waterloo for a year. Use this route? Email your objections to Southwark today. of this hotel better site access. ﻿﻿I almost couldn't believe this when I saw it earlier today. One quick-eyed reader noticed an announcement in today's edition of Southwark News. From October, the developers of the new buildings popping up along the southern side of Blackfriars Bridge will have the right to shut Upper Ground to all vehicles. For an entire year. Starting on October 5th. For those not familiar with Upper Ground, this is the section of National Cycle Network that goes between Waterloo and Blackfriars Bridge. If you're heading south over Blackfriars, you can duck onto the cycle crossing and head over the road down Upper Ground for a relatively leisurely ride to the station. The alternative is to signal right and cross four lanes of traffic coming off the Bridge and to head along Stamford Street. I find it almost impossible to believe that a council like Southwark which is trying relatively hard to get its cycling strategy right could simply shut one of the busiest cycle commuter routes in central London for a year. Unless I'm reading Southwark's intentions wrongly (and you can read below a copy of the notice in today's Southwark News) it's pretty clear that the national cycle network from Waterloo to Blackfriars (and on to London Bridge) is simply going to be closed to all traffic, including bicycles, for a year. There are four separate development schemes going on around this junction. Two along Upper Ground and two new developments on the other side of Blackfriars Road. I know that Transport for London - which is responsible for the main crossroad junction at the end of the bridge is considering ways to make the junction easier and safer to use on a bicycle. the four lanes of motor traffic. Southwark's traffic order suggests that cyclists should take a diversion for the 12 months that Upper Ground is closed. That diversion is to head south over Blackfriars Bridge, then turn right across four lanes of traffic into Stamford Street, then turn right again into Hatfields with queues of impatient taxis trying to get past you, then carry on down the quiet route to Waterloo. My own view? This is one of the busiest commuter routes in central London (you can get a sense of how busy just by looking at Oliver O'Brien's maps of cycle hire usage data, which shows the high number of people who use this route). It is the only relatively safe route for the thousands of journeys (especially Boris bike hire journeys) from Waterloo to the City. And Southwark council is literally chopping the route in half. The dedicated cycle crossing from Blackfriars Bridge into Upper Ground is already fairly haphazard. The right turn from the Bridge with the main motor traffic flow can be downright terrifying at times (particularly later at night). I think Southwark's move to sever the national cycle network route to Waterloo is a recipe for disaster, especially for slower cyclists, people using Boris bikes and for everyone (and there are many thousands) who use the quiet route, rather than dodging the cars on the main road. this will be closed from October 5th. What's more, this sort of thing simply couldn't happen in countries where cycling is taken seriously as a form of transport. In the Netherlands, for example, diversions and traffic lights would be installed to allow large volumes people to cycle safely. Here, Southwark seems to be saying to people, just get on with it and enjoy cycling with the lorries. It may be too late to object. But if you use this route, I think you should flood Southwark Council with your thoughts. Southwark is doing a lot of good work around cycling. I have to hope this is a horrendous oversight. To think if this work was being carried out over in the Netherlands a replacement cycle route would have been put in place as part of the works BEFORE the closure so cyclists still had a safe passage. I'm sure I've seen a post of View from the cyclepath showing just that, embarrassingly it seems even their "temporary" cycle paths are of a far higher quality then the ones we get here. I also think for those particular works tat motor traffic was still sent on a rather longer diversion. 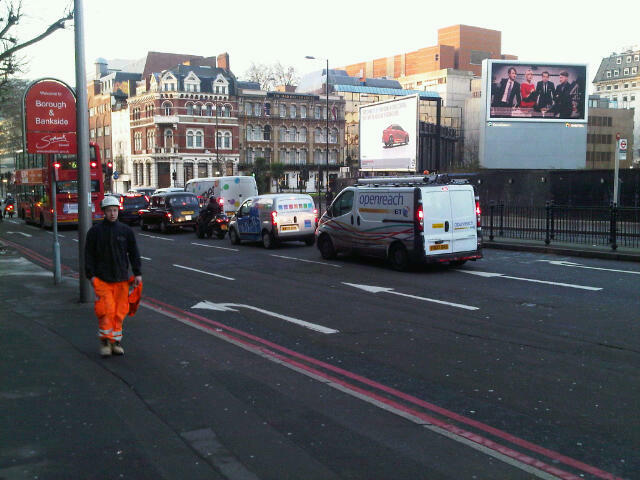 Can't get up Weston st on the northbound approach to London Bridge at the moment either due to works. The cyclist diversion takes you 50 metres along a busy pavement. Bizarre since I managed to find a much better diversion just 10 metres back up the road...Clearly 0 thought gone into it. Indeed it is just around the corner from where London Critical Mass sets off each month. Points 7 and 9 of the notice may allow for cyclists to cycle there "legally" but from what I've seen around the Shard, people on bikes make their own decisions. There are certain aspects of the route along Upper Ground that I have never liked, in particular the awful surfacing which is really bone-shaking on a Brompton with its small wheels. The tarmac is badly degraded and the brick pavings on the speed cushions are very poorly laid so that they are lifting and buckling. As a result, some years ago I started to use Stamford Street instead, and turn right from Blackfriars Bridge Road. I kept this up until the water main works on the eastbound side of Stamford St, when I went back to Upper Ground. When those works were finished I tried Stamford St again and found that in the intervening period of almost a year, I must have aged, or got more nervous, or something, because I only did it the once before I decided that the wobbly cobbles were still preferable to the sheer terror of dodging traffic and negotiating pinch-points on Stamford St, and in any case if you ride along the strip of new tarmac covering some recent roadworks there, you avoid the worst of the degraded surface. I am unimpressed with the notion that I could turn right again into Hatfields and rejoin Upper Ground just in front of the Oxo Tower. It is adding to my cycling distance (and I am doing a A-B traverse here, not out for the thrill of it) as well as demanding another unpleasant manoeuvre. Frankly, you might as well carry on to the Imax roundabout because you are over the worst by then. I have written to Southwark to express my disgust, but no doubt this big construction company will get what it wants, regardless of the views of a couple of thousand or more city slickers like who BB or Brompton their way from Waterloo to the City every day. The best we could hope for would be temporary adjustments to the junction layout at Stamford St to accommodate cyclists, but as that is in the hands of TfL I have no great expectations on that score either. Firstly, I am grateful to the Invisible Man for saying much better what I was trying to say yesterday. But I would still point out that we need to turn a corner, and Sir Malcolm's point that support for cycling should also be complemented by a shift in behaviour of a minority of cyclists who flout the rules of the road is absolutely no skin off my nose, particularly if it means the authorities would start to meet us halfway. But they have got to meet us halfway, and this latest development seems to reinforce the view, as expressed by the Invisible Man, that politicians seem to expect cyclists to take up no real space, to get in nobody's way and to behave angelically in the face of the atrocious behaviour of most other road-users. Surely they realise just how very unsatisfactory this is. Paul M has commented before that using back streets would be excellent advice were it not for the one-way systems. A good case in point is the journey from Waterloo to the City, as can be seen on this map. Excellent post. I've dropped the two lads an email as you advised. Everyone else should too. Hopefully something can be done about this going forward. Last time they closed this area temporarily, when travelling west I took my usual path from Blackfriars bridge to Upper Ground, turned left down Rennie Street, scooted or rode (depending on pedestrian traffic) along the pavement and then turned right down Hatfields. Going home I did actually ride along Stamford Street as far as Rennie Street but if the traffic is bad I will take to the pavement. No, its not a proper cycle route, and yes, Southwark should have done better. I merely offer it as an alternative for those of you who like me find Stamford street an unattractive prospect. One of the joys of bicycles is that you can always get off and walk.